Null detector at the bottom. 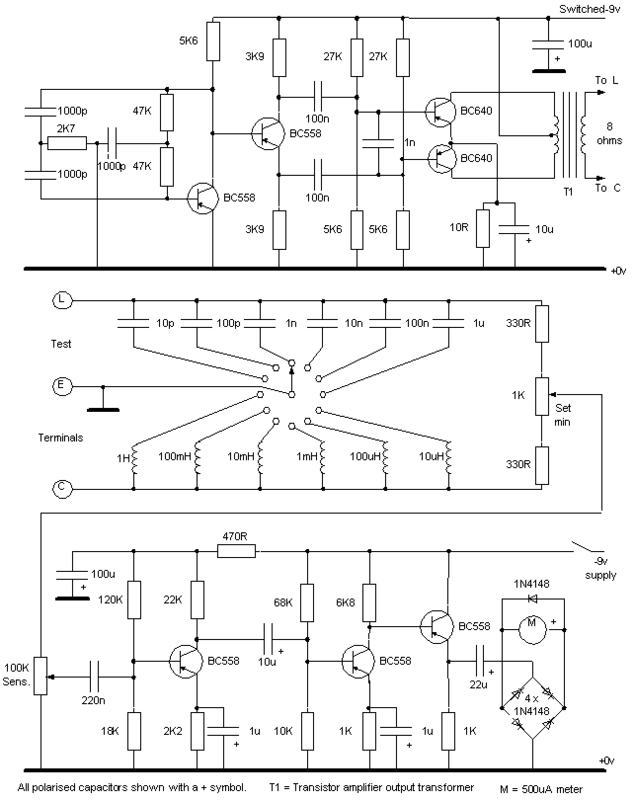 This is a simple circuit using mainly non-critical components. It lacks a balance control to remove the effects of any resistive elements in the component under test and this will show up as a poor null with some components. The whole instrument should be built in a screened enclosure of some sort to minimise the pickup of external interference like mains hum or RF signals. Dead bug contruction will be fine. The only critical components are those in the bridge which determine the overall accuracy of the finished instrument - 2% or 1% are suggested but this is left to the constructor. The Set Null should be a Cermet potentiometer. Polarised capacitors can be electrolytic or tantalum as preferred. On completion of test, the Set Null control dial should be calibrated using accurate high tolerance components. Capacitors to be tested are connected to terminals C and E. Inductors to be tested are connected to terminals E and L. Connect the component to be tested, switch on, set the sensitivity control for about 75% meter reading and then adjust the Set Null control for a minimum meter reading. Read the value off the calibrated dial. Switch off when finished to maximise battery life.